Currently available on the Comichaus App (CLICK HERE). If you claim to be a fan of the Noir genre then at some point you should have read at least one of the PARKER novels by Richard Stark (the pen name of the great Donald Westlake). Parker is a master thief and peerless tough guy who grifts and punches and occasionally shoots his way through some of the finest noir fiction ever written, starring in, I think, 24 of his own novels over a 40+ year period. 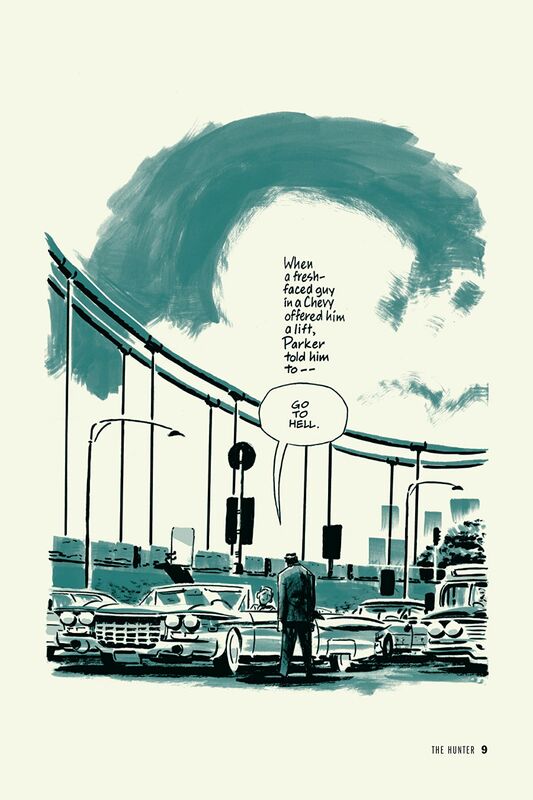 If you haven’t read any of the novels in their original format, you may have seen Parker (although not necessarily using that name) in some of the big screen adaptations of the books such as Lee Marvin in POINT BLANK, Mel Gibson in PAYBACK, Robert Duvall in THE OUTFIT, and Jason Statham in PARKER. So by now, 90% of you that are still reading should at least have read the book or watched the movie so we can move on with a gist of what this particular story is about. Fundamentally THE HUNTER is a story about revenge, retribution and restitution. Mal Resnick has stolen almost everything from Parker; his money, his wife, his home, and he has also tried to take his life. Resnick’s big mistake is that he didn’t finish the job, and Parker is someone who if you cross him, you’d better make damned sure he’s dead because nothing on Earth will stop him finding you and taking his revenge. Where things really heat up is that Parker also holds Resnick’s masters, the heads of The Organisation, responsible for paying his debt. 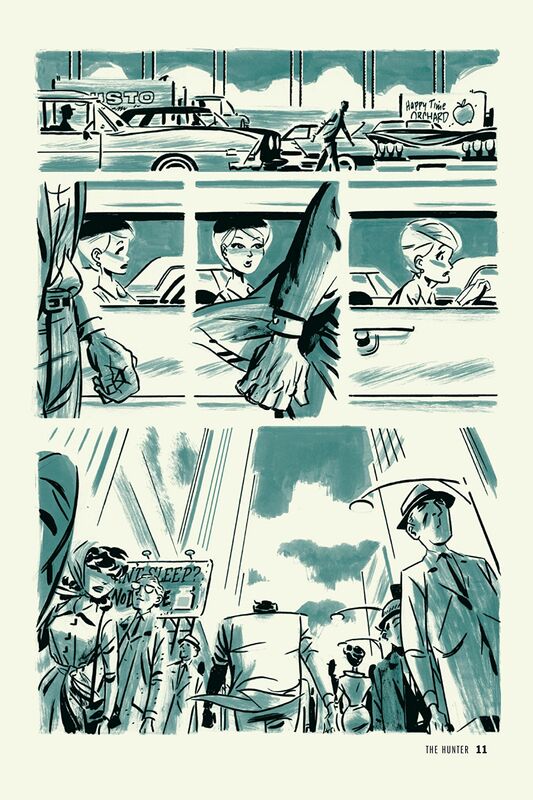 Darwyn Cooke’s adaptation of the original novel is a fantastic, textbook noir thriller that pulls absolutely no punches. Whilst I can’t give him credit for the story, I can say that Cooke’s delivery of it in this format is both a brilliant book in its own right as well as being a worthy tribute to Stark/ Westlake’s original character. Parker is a character who is ripe for the graphic novel treatment; he’s an old school wrath of God, eye-for-an-eye career criminal with the sheer unstoppable, force of nature persistence of The Terminator. I think this is where Cooke’s artistic style really works in delivering this story. Parker, as I’ve already suggested, is a very black and white, direct character who sees the point he wants to get to and simply cuts a straight line to it, bulldozing through whatever is in his way. Cooke brings this to life, giving us fantastic dark and gritty artwork but also that great 1950s stylised presentation that enables the artist to do so much with what at first glance seems very sparse detail. I also thought the use of one colour throughout helped to really highlight the dogged single-mindedness. 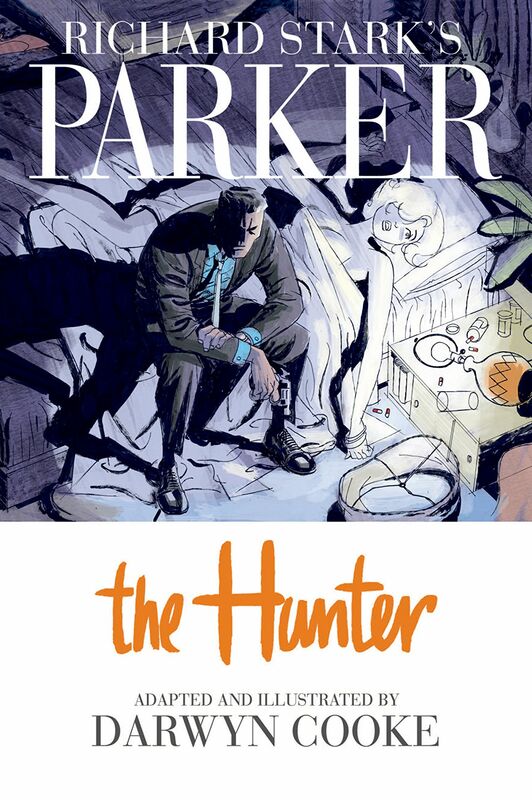 THE HUNTER is the first of four of Cooke’s adaptations of the Parker novels, and a book that I think you really need to read. 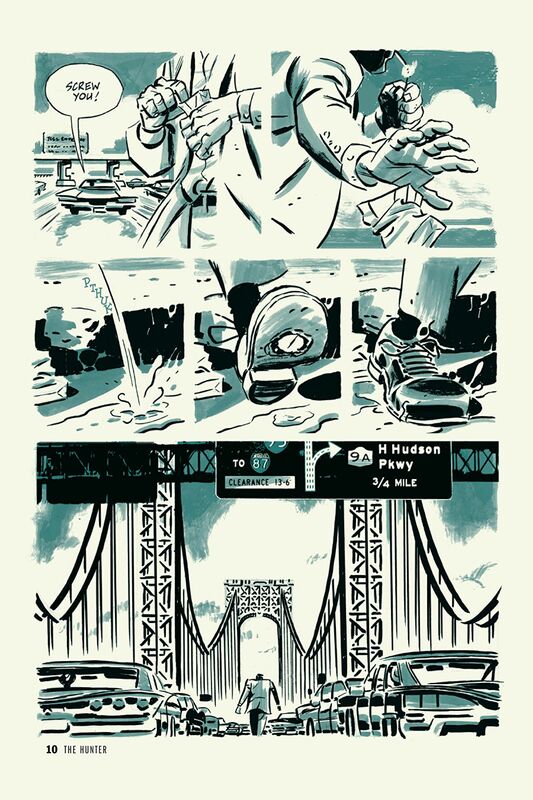 Read it if you’re a Noir fan, read it if you’re a fan of any of the films, read it if you’re a fan of Donald Westlake, read it if you’re a fan of Darwyn Cooke, but whatever your reason, just read it.